After two years traveling through space, the NASA OSIRIS-REx spacecraft has started to obtain images of the mission target, primitive asteroid Bennu. As part of the Scientific Team of this mission, researchers from the Instituto de Astrofísica de Canarias (IAC), Javier Licandro and Julia de León have already started to work in the calibration of this images in preparation for the ones that will be obtained in December 2018 using color filters. The launch of the NASA OSIRIS-REx mission took place on September 8, 2016. Since then, the spacecraft has been two years traveling through space to reach its target, primitive asteroid Bennu, in October, 2018. The first images of the asteroid are being obtained using one of the three cameras on-board the spacecraft (PolyCam) from a distance of 330 kilometers. During the bare minute elapsed between the first and the last of a total of eight exposures, the asteroid rotated 1.2 degrees. The scientific team used a super-resolution algorithm to combine the eight images and produce a higher resolution view of the asteroid. 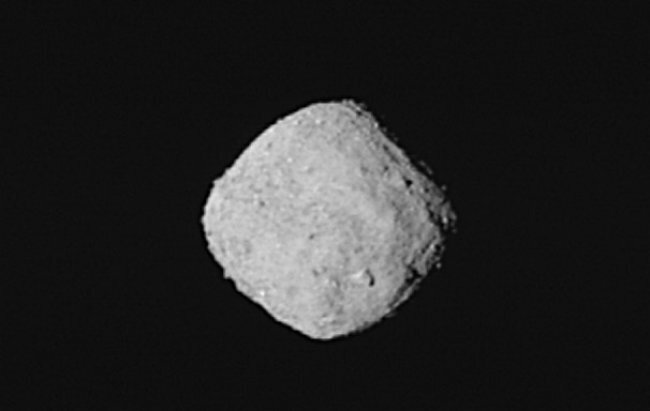 Although Bennu occupies barely 100 pixels in the detector, it is possible to identify some features on its surface, like large boulders. These first images of Bennu present a remarkable similarity with the ones recently obtained by the JAXA Hayabusa2 mission of another primitive asteroid, Ryugu. “The fact that the Japanese mission has reached its target a little ahead of us turns out to be extremely interesting, as we can now interpret our results and compare to the results obtained by another mission almost on real time”, explains Julia de León. The IAC team, which is part of the Image Processing Working Group (IPWG) of the mission, includes also Juan Luis Rizos García, who is currently doing his PhD at the IAC with the images of Bennu obtained by OSIRIS-REx. “The first images that capture the entire asteroid are used for an important number of calibrations that are fundamental to correctly interpret the results obtained from higher resolution images using different color filters. Doing such calibrations is part of my work”, says Rizos García. “In December 2018 we will start to obtain images with MapCam, also one of the cameras of the mission, using color filters. This will allow us to generate color maps and to study the geographical distribution of different materials on Bennu, including silicates altered by the presence of liquid water”, adds Javier Liandro. The studies done by the IAC team will also help to select the region on the surface of the asteroid from where a simple will be collected and returned back to the Earth in 2023.